Beirut. Eternal in the precariousness of the riddled terraces, ephemeral in the glass skyscrapers mirroring an empty future. The city is beat by a cutting rain announcing the coming of winter. Gurgling in the manholes, a thick slime regurgitates smells that had gone covered by months of draught. The great Armenian cornerstone in the Middle-East, Burj Hammoud, is strangely silent, muffled by the grey sky brushing over the rooftops. A tall and pale building, drooping over the highway, is the seat of the Tashnag, one of the three Armenian parties represented in the Lebanese Parliament. The porter announces me through the interphone. “Please, Mr. Pakradounian is waiting for you in his office on the fifth floor”. A middle-aged man, the deputy dominates from his leather chair. Outside of the window behind him, the low houses of the Armenian quarter fill the sight up to the low line of the clouds. ‘I have been told you have travelled extensively among our brothers of the diaspora. I am guessing today you want to discuss the situation of the Armenians in Lebanon’. Historically, the Tashnag is the party with the most followers in the Armenian community, and one of the most influential political bodies in the Country. 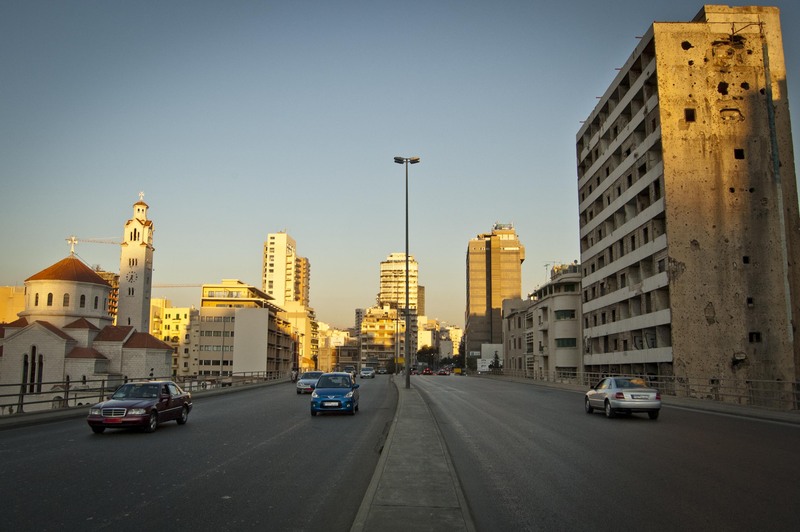 The quarter of Burj Hammoud has never had an MP that was not from its ranks. ‘No, I would like to talk about Syria’. A few months after the first street demonstrations against Assad’s regime, the Syrian Spring assumed the likeness of a civil war. The scream of youthful rage, started at the end of 2010 in Tunisia and able to overturn two governments and make all Arab dictatorships totter, is becoming stranded on the urban guerrilla in the Syrian provinces of Hama, Homs, Daraa. As the other minorities in the Country, the hundred thousand Armenians hold more and more marginal positions as violence increases. The protest front line, less and less across-the-board, is growing increasingly extremist, while the role of weapons grows greater by the day. ‘Armenians do not fear change’. Pakradounian speaks with the tone of someone who wishes to justify a difficult choice. ‘But they do fear taking leaps in the dark, because they know how dangerous it can be. Those like us, who have lost their home once, cannot risk losing it again’. The genocide, the ever-lasting existential mark on the identity of the Armenian diaspora, emerges with the force of a dogma. ‘You cannot ask Armenians to do more, anyway. The role of our diaspora in the Middle-East has never gone beyond the economic sphere, it has rarely crossed politics’. When the Lebanese civil war broke out in the mid ‘70s, the representatives of the Armenian community agreed absolute neutrality between the fighting parties. Twenty years after the end of the conflict, that choice is still felt as a moment of success. ‘Besides political strategies, do Armenians believe in the objectives of the Arab Spring or do they not?’. Pakradounian leans over his desk, as if seeking greater intimacy between us. ‘With time, the Countries we live in - Lebanon, Syria, Jordan, Iraq - have become our home. Arabic has become our language. Unleavened bread has become our food. But let’s not forget it: we belong to a different history. And our objective lies somewhere else: re-gaining the rights lost on our Fathers’ lands’. The deputy is at ease again, as if he just got a heavy truth off his chest. ‘But besides that, we will always be grateful to the Arabs for having welcomed us in their home. Irrespective of whom is sitting on the leader’s chair’. Behind him, a map of Greater Armenia boldly stretches from the rising Nagorno-Karabakh to the Anatolian plateau, from Southern Georgia to the Azeri enclave of Nakhichevan. From Yerevan to Beirut, from the Caucasus to the heart of the Middle-East. By land, to measure the size of a history that is not keen on being framed on a map. The journey through the lands of the Middle-Eastern Armenian diaspora has been accomplished, but almost all the questions I posed myself on its eve still go unanswered. The only conclusion that I note down on my journal is that, as far as this adventure goes, History cannot provide answers: on the contrary, History is the steaming battlefield where the enemy is chased, vengeance is sought and trenches of wrath between Man and his dreams are dug deeper and deeper. The Bekaa valley is covered in the tenuous colours of autumn. Hrayer is driving along the bare rows evaluating the work that he is going to do in the fields. ‘Pruning and ploughing, so the land is at rest during the cold months’. Anjar, the village founded in 1939 on the Lebanese mountains by the Musa Dagh Armenian refugees, appears at a distance, framed by the blue of a sky that rarely gives itself to Beirut. ‘Before leaving for Armenia, I made the promise that I would show you the flag of the Musa Dagh combatants’. The boy, met on these hills almost a year ago, smiles savouring what he is going to say next. ‘Good thing you have come today’. Anjar’s priest takes us through the Church and into the vestry. Among the sacred images that embellish the vault, a series of frescoes tells the dramatic passages that have marked the history of the community. The battle against the Ottoman troops in 1915 and the headlong flight on a ship; the arrival to Port Said and life on a refugee camp; the first terrible winter in the tents on the Bekaa plateau. With measured gestures, the priest opens the door to a storage room. The look is attracted by a white drape hanging on the wall, protected by glass. Coarse seams draw a huge red cross in the middle of a rectangle. ‘It’s made with pieces of sheets and rags’. The priest looks at the flag with familiar eyes, as if it were an old acquaintance. ‘It was hoisted in 1915 by the combatants of Musa Dagh after a resistance of over a month on the mountains’. Pushed to the end of their strength, the Armenians found refuge on the last possible defence line: Musa Dagh, the highest mountain. Unable to break the siege of the Ottoman troops, they settled the flag on the top, hoping some ship transiting in the near Antioch Gulf would see it. ‘Fortune was on their side. In the middle of the night, the survivors were able to reach the shore and board a French ship. Of course, they took the flag along’. His hand brushes against the glass. In the garden surrounding the church, a monument gathers the ashes of the eighteen martyrs of the battle. While the cold wind that precedes sunset is taking over the valley, Hrayer accompanies me on the last visit to his village. 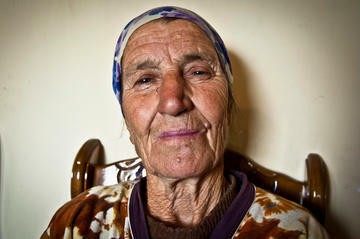 Angel, the oldest woman in Anjar, is sitting in the same spot I left her over a month ago. Her stories, 90 year-old memories, have been the underlying theme of the journey tracing the Armenian diaspora through the Middle-East. Behind her, at a distance, the thin mountain range of the Anti-Lebanon is flooded with red light. Beyond those rises, Syria lays mysterious and soldier-like. ‘I have a surprise for you’. The woman’s look nervously follows my hands as I take a picture out of my backpack. Angel grabs it: in that face so much like hers, it is as if she were looking at herself in the mirror. In the wrinkles lining the face, she measures the depth of hers. In those bright eyes, hers are reflected. ‘It’s Vartuhi, your sister’. Angel answers without being distracted. ‘I knew right away. From her eyes’. The woman remains absorbed till the sky turns dark. Angel and Vartuhi have not seen each other since 1948, when they were divided by a history that gave refugees only one-way tickets. Angel in the mountains of Lebanon, Vartuhi in the flat countryside of Armenia. No more pictures in my backpack. I venture on my own to write the final chapter of this story. The taxi to Damascus has comfortable chairs and the atmosphere among the passengers is light. Increasingly small and farther away, for the first time Beirut appears to me as a beautiful city.